just beneath the skin of the the fingers and the palm of the hand. fingers to curl up into the palm. 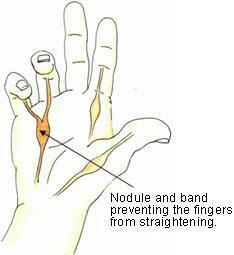 This is known as Dupuytren´s contracture. The reason why fibrous nodules and cords form is not fully understood. It used to be thought that the disease was caused by heavy manual work, but this is not the case. Dupuytren´s disease is more common in men than women and has got a genetic link. It can however be assosicated with diabetes, liver disease or smoking. After treatment, your hand should be more functional and not interfer with activities of daily living. 1. non-surgical treatment. Xiapex consists of collagenase from the bacterium clostridium histolyticum. Xiapex is a pharmacological agent which can be injected into the cords. This can usually be performed in the office. 2. non-surgical treatment. Percutaneaous needle apponeurotomy. This procedure is minimally invasive and can be performed under local anaesthetic in theatre. Although treatment is not essential, Dupuytren´s contract does not get better without it. The condition will often get slowly worse with time and if left untreated your finger joints may become permenantly stiff. After the operation you will be transferred to the recovery arear and then to the ward. You will need to keep your hand lifted up in a sling or on a pillow next to you when you are in bed. You should be able to go home the same day, however ocassionaly you will have to be admitted for one night. You will have an outpatient appointment to check that the wounds are healing satisfactory and we will arrange a splint to wear on your hand at night. Do not drive until you are confident about controlling your vehicle and always check with your doctor and insurance company first. It can take some time for your hand to settle down after surgery. Slight stiffness of the finger joints is fairly common. The scars can be fairly thick at first but will gradually become less obvious. Dupuytren´s disease will porbably come back in most people eventually, but will not always need further surgery.